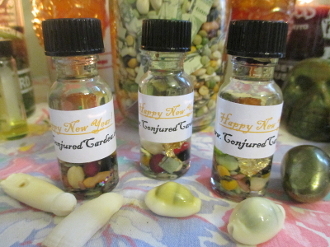 This my own original recipe which I created to bring you the most bountiful and prosperous blessings in the New Year! BUT it can be used ANYTIME you need an extra boost of good fortune or power in your life or workings-NOT just at the beginning of the year! Use on green, orange or yellow candles to gain employment, open roads, win at games, get a raise, find a new love, enhance your relationship-or just bring a little celebratory energy to yor life! This formula is created with my special 7 bean mix, gold leaf, a di, glitter, clove, fennel, lodestone, my Red Hot rice and my Lucky Green Rice, cinnamon essential oil and MORE! Thanks for looking!